May 22- Last Day of School! Remember to Keep Our Kids Safe! – DO NOT park, pick up, or drop off in the Red Zone, between the cones. – DO NOT use the curb for parking. If you have to leave your car unattended, use the parking stalls, not the curb. 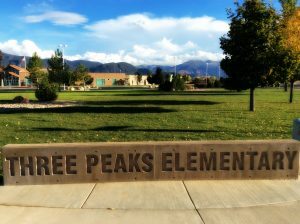 – DO NOT use the Three Peaks Preschool parking to pick up or drop off Elementary students. – DO NOT use the handicapped parking illegally. – DO drive slowly and cautiously through the parking lot and remember to take turns. – BE AWARE of children and other cars. These procedures will ensure the safety of the students at Three Peaks Elementary. The Three Peaks Elementary Preschool parking lot is to be used only for parents of preschool students. Please do not park your car in their parking lot to pick up or drop off your students. Thank you.